Here at Hartig Yoga we also provide Private Yoga Classes. Whether you want a One to One session, Small Group Yoga session (2-6 people) or a Larger Private Group session (maximum 25 people), we can meet your needs. Classes can take place at your home or hotel, or at Palm Cove Beachfront, where we hold our group classes. A 1 to 1 Private Yoga Class. Great for those who want a private session before joining a group class, or for those that have specific needs such as an injury or health condition. To see our blog on the benefits of private yoga tuition, click here. A Private Group Yoga Class (2-6 people). Great for couples, families and friends who want a class by themselves. A Private Large Group Yoga Class (7 people+). Great for larger groups, i.e. Hen/Wedding parties and Conference groups. Who are One on One sessions suited to? Complete Beginners who want a sequence and practice designed specifically to meet their needs. Those who want to understand the basics of Yoga before joining a group class. Those with prior yoga experience who want help with certain postures or have questions about their alignment and practice. Those recovering from injury or health problems who want a practice tailored to their needs. Those who simply want to be guided through a beautiful sequence in a beautiful location. Cost = $70 per hour. A perfect activity for couples – we often cater for newly weds or couples on holidays that would like a romantic private beach class. Great for Wedding Groups (de-stress the morning before the wedding!) or Hen/Stag weekends. Great if you want to create your own yoga retreat whilst on holidays. Classes can be arranged for every morning/afternoon of your stay. Perfect for Birthdays and other Special Occasions. We have also catered for whole families in our private classes- it is such a wonderful activity to do together. Cost = $100 per hour. Perfect for Conferences or Larger groups of people that are visiting Palm Cove. 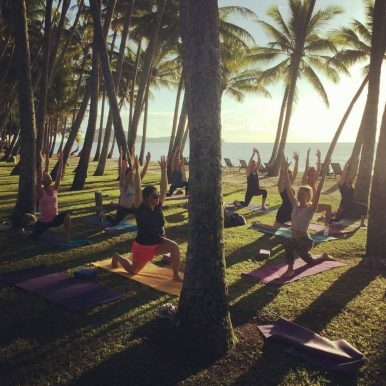 Hartig Yoga can provide the yoga for your retreat– either in your own location or at Palm Cove Beachfront. Classes can cater for all levels, from complete beginners to intermediate practitioners. Cost = $20 per student. 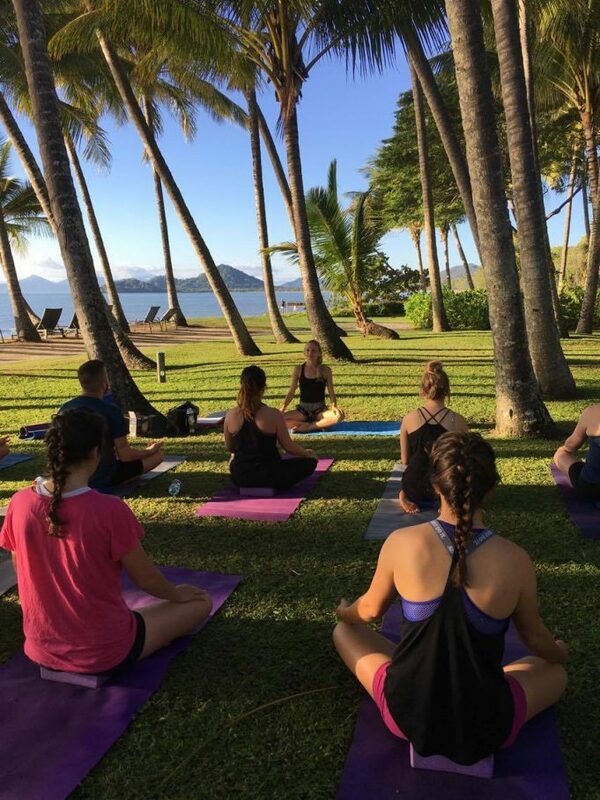 Our Private Yoga Classes can take place on Palm Cove Beach, at the same location as our group classes- on the grassy area, under the palm trees in front of Alamanda Resort, Palm Cove. Alternatively, if you would prefer, our teacher can come to your home or hotel to facilitate your yoga class. All mats and props will be provided. Our Yoga Teachers are trained in many styles of yoga- Ashtanga, Hatha, Vinyasa and Yin so your class can be designed in your preferred style. If you are not sure of Yoga styles, you can simply ask for a more energising/flowing class, or a more gentle and meditative style, for example. We are also happy to incorporate themes into our classes, so if your conference or retreat has a particular theme, or you simply feel like working on a certain area in your body, this can be catered for. Contact Beth Hartig on 0421322691 or at bethanyhartig@gmail.com informing us of when you would like your private yoga class. Once we have confirmed the date and time is available, you can pay online by selecting your option above and following on screen instructions. Please note, it is not possible to book a Private Large Group Yoga Class (7 people +) in this way. Please contact us to organise payment for this larger group. Here are a couple of testimonials from our private Yoga Students. To have a look at some more of our reviews, visit our Trip advisor Page. ”My girlfriend and I recently spent a great relaxing long weekend in Palm Cove. On researching some things to do we came across Hartig Yoga and booked a private class with Bath, She met us on the beach front underneath some palm trees which was pretty idyllic. After a long day flying up from Sydney it was a great way to rid of the travel lethargy. Beth tailored her class to the both of us having requested a vinyasa practice and kept an eye out on our form- my girlfriend being the long term practising yogi.. me having done a handful ever! It was such a nice class and a beautiful setting that we decided to join her group class first thing in the morning a couple of days later.